We understand how important your brand is so why don't you brand, with your products in mind. As we 3d printed food we can control the shape being made. This allows us to produce the actually products that your company makes as your give away. It can be a physical items or a 3d form of your company or event logo. We take care of the design side while providing you the WOW side. Everyone knows that when you go looking for a new car the sale team often asks you if you would like a cup of coffee. But what if the sugar cube or treat was the actual car you were looking at? This delivers an experience and a brand like never before. We know it works because we have tried it. Customers were amazed with the sugar cube was the car that they actually looking at. Many did not eat it and instead took it home with them. Some even came back for more. This is a way of delivering a brand and a product like never before. This is a completely new way of reaching your customers on a personal level. Make our treats your new business card. Don't just leave your details but your product too, in this fun & enjoyable way. It all starts with an enquiry. Would you like us to help you reach your customers in a fresh and fun way? Contact us. Give-away's are packaged with a card you can make use of. The card is 6.4 x 4.9cm. The front side is available for you to make use of. whether it be a logo or a message. The back side has our logo. Each give-away is then packaged in a clear foil. Our packaging is food grade & made from recycled materials. We will create a one of kind design or receive 3D product design form you. 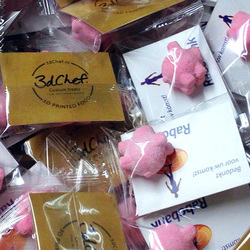 Once the design is approved we go to print and 3d print your designs on our very own custom 3d food printer. Once everything is ready we pack and ship your order directly to your door. What started as a twitter comment became these mouth full treats for a prominent Dutch Bank in the form of a piggy bank. For a cafe dedicated to coffee lovers. 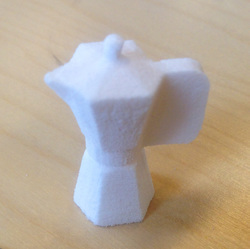 We print these coffee themed sugar cubes. 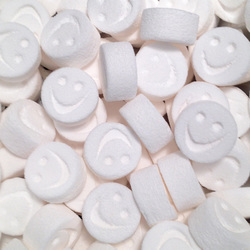 Each one is exactly 2 standard sugar cubes. Service with a smile. These little treats combine part of the company logo and there tag line to produce a brand related treat.